Amy Emms was an English quilter and teacher who revived Durham quilting in England. She was awarded an MBE award at Buckingham Palace for “services to quilting” in 1984 and in 1992 was inducted into The American Quilters Hall of Fame, Marion, Indiana. She enjoyed quilting on satin, occasionally silk, using her favourite patterns, “Durham feather,” “feather twist” and “scissors,” in medallion designs her wholecloth quilts. At the age of 86 she wrote her autobiography, Amy Emms’ Story of Durham Quilting, edited by Pam Dawson. As most of you will be aware, the Amy Emms MBE Memorial Cup is awarded each year in her name to people who have made a contribution to hand quilting in the UK, and this year the Award has been won by our very own Jeanne Stetson. As well as the silver cup, Jeanne also received a box which contains a number of things that each winner has to add to and then pass on. Those of us who have been lucky enough to have been students of Jeanne’s will not be at all surprised by this long over-due accolade as Jeanne’s talent, dedication and loyalty to hand quilting is legendary. If you were at the 2009 A.G.M. you will have heard her quilting story and seen her beautiful quilts. So well done to Jeanne on such a wonderful achievement. 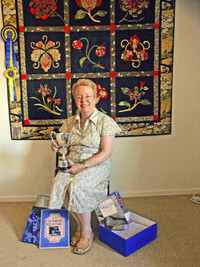 I am sure all South West Quilters are united in sending congratulations on the Award and for putting us on the map. The question now is…. do we have to curtsey when we next meet Mrs. Stetson?